Over recent years there seems to have been a growth in the amount of acoustic based styles and artists coming out of Africa. 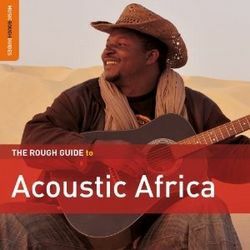 World Music Network’s “Rough Guide to Acoustic Africa” is - as most of their compilations are - a welcome introduction to a selection of what this amazing continent has to offer on a more acoustic, unplugged tip. The album (to be released 25th March 2013 - RGNET1279CD) contains 16 core tracks that skip across the continent from sub-Saharan Sudan and Niger, via Senegal, Mali, Guinea and Ghana in the West, Cameroon and Congo in the centre and Zimbabwe, Lesotho, South Africa, Mozambique and Madagascar in the South East. There’s also a free bonus CD “Faling” by Senegalese kora player Noumoucounda Cissoko which is well worth listening to! All apart from 3 tracks on the Acoustic Africa album are guitar based, the other main acoustic instruments including mbira, accordion, kora, oud and valiha (a Madagascan tube zither). The whole album is quite laid back and relaxing so should appeal to those who like their music as mood enhancement as well as your average world music fan (ha ha! is there even such a thing?). ""one of the highlights of the album"
There are some well-known names popping up here: for instance, Guinea’s legendary Mory Kante sings in his distinctive voice and style a beautiful but sad song (“Djou”) about refugees and a mother’s struggle to provide food for her son. Understated, but one of the highlights of the album for me. Etran Finatawa from the desert regions of northern Niger take their mixed Tuareg and Wodaabe heritages to open up the album. Syran Mbenza and his Ensemble Rumba Kongo deliver a little slice of laidback accordion and acoustic guitar magic called “Mbanda Nasali Nini?” (aka Madeleine) which pays homage to the great Franco. It succeeds in being both elegant and downhome at the same time. "a little gem of a tune"
Lesser known, but providing a little gem of a tune are the Mozambican group Eyuphoro with a plea for people to empathise with the poor and the ill called “Masikini”. The track “Yekanini” (All Is Lost) by the late Kwa-Zulu Natal masakanda maestro Shiyani Ngcobo is definitely worth a listen to. Love the fiddle work. "wild bluesey guitar and kora weave in and out of each other"
My favourite on the compilation though has to be Nuru Kane, a member of the Senegalese Baye Fall sect. His contribution to the album, simply entitled “Africa” is positively pumping with energy as wild bluesey guitar and kora weave in and out of each other over punchy bass, calabash and fabulous, rippling balafon. Very good indeed. And if that wasn’t enough then there’s the introspective guitar stylings of Mali’s Samba Touré, some lovely old school palm wine highlife from Ghana’s Koo Nimo, the jangly, rattling call-and-response trance of Sotho Sounds and the mbira and sax-soaked afro-jazz vocals of Monoswezi. I’ll give a mention also to Amadou Diagne (a lovely guitarist, singer and percussionist), although personally I prefer some of his other tracks from the “Introducing Amadou Diagne” album rather than the one here, as well as Madagascar’s Lala Njava and Vakoka, Mozambique’s Mabulu and a beautiful but wistful track called “AIDS”. With the compilation being rounded off by Cameroon’s Mr Eddy and Sally Nyolo and Sudan’s Abdel Gadir Salim this is a nice overview of acoustic Africa. I imagine they’ll have easily enough material for a follow-up album next year too. And that free bonus CD ("Faling") from Noumouncounda Cissoko? Well worth it in my opinion - the kora-playing griot joins ranks with Switzerland’s Phat 4 for a melange of mbalax, jazz, reggae, blues, hip-hop and rock.